In the 2018-2019 academic year, I am blogging and providing a forum for book study discussions on each chapter in the book. See the months listed below in parentheses next to each chapter. 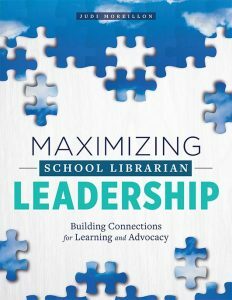 In this book, preservice and practicing school librarians, district-level library supervisors, school librarian educators, school principals and administrators, and others will find strategies to position school librarians as leaders. In their leadership and instructional partner roles, school librarians make essential connections that build and sustain a culture of learning in their schools. In the process, they engender library advocates for the vital work of the school librarian and the essential role of the library program in education. Selected figures and graphic organizers from the book are available online as Web Extras from ALA Editions.